Third floor view of Ala Moana Shopping Center, one of the best places for shopping on Oahu. Most people are drawn to Hawaii for the stunning beaches, scenery and rich cultural heritage. But Hawaii is also a place to shop for designer brands, souvenirs, Hawaiian apparel, local crafts and artwork. While some people find shopping stressful, others find it relaxing and rejuvenating. If it’s a key part of your ideal vacation, here are some of the best places for shopping on Oahu. Be prepared to spend at least a day wandering through the Ala Moana Shopping Center. This labyrinth of over 300 shops could be one of the best places for shopping on Oahu. The Ala Moana Shopping Center has long been the place to shop in Hawaii since it opened in 1959. At that time, it was the largest shopping center, of any type, in the world. Today, it’s still the largest open-air shopping center anywhere. The recently-opened Ewa (west) branch of the center just added 37 restaurants and stores. Here, you can find classic department stores like Macy’s, Neiman Marcus and Nordstrom. You can also find plenty of luxury brands and designer stores. Examples include Versace, Armani, Chanel and Ralph Lauren. 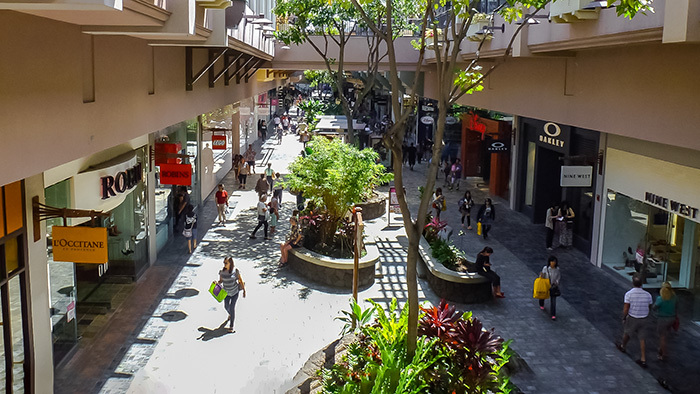 This place is one of the most centrally-located shopping centers in Hawaii. There are also many seasonal events taking place during holidays, including live music performances. If you only have one day to devote to shopping, Ala Moana is a fantastic place to go. 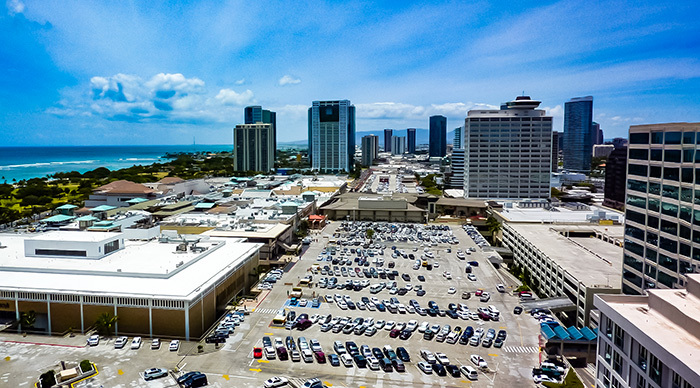 View of Ala Moana Shopping Center. Part of what makes this area west of Waikiki special is the Ward Village. It’s a thriving residential, shopping, dining and entertainment complex. There are five distinct venues at the Ward Village to explore. They are the Ward Gateway Center, Ward Entertainment Center, Ward Village Shops, Ward Warehouse and Ward Center. Each offers a wide range of shops, dining and entertainment options. There is even a Farmer’s Market at the Ward Warehouse every Saturday. At the Ward Entertainment Center, shoppers can take a break in their day by seeing a movie. There are even live performances at many of the restaurants. And the boutiques with locally-made arts and crafts make it an interesting place for shopping on Oahu. Located in Waialae-Kahala, visitors can enjoy a less congested shopping experience at the Kahala Mall. It’s a place offering a great combination of retail stores, restaurants and entertainment. There are Macy’s, Whole Foods, apparel and home décor boutiques as well as a movie complex. Plus when shoppers get hungry, they can find everything from sushi to all-American burgers here. If you are staying at this upscale Waikiki resort, you won’t have to travel far to shop. You can find over 90 shops, restaurants and bars here. The stores are split into several areas. These are the Kalia Tower, Ali’i Tower, Diamond Head Tower, Rainbow Bazaar and Tapa Concourse. Here, you can find designer clothes, hand-made ukuleles, pearl jewelry, Hawaiian quilts and other fine gifts. There are even places to relax and unwind, like the Mandara Spa. There is even a US Post Office to ship the things you buy in Hawaii. For those wanting duty-free items, T Galleria Hawaii is a great place for shopping on Oahu. Located in Waikiki, tourists can find brands like Balenciaga, La Mer, Kate Spade, Marc Jacobs and Prada. If you didn’t pick up some gifts and souvenirs for your friends back home, never fear. T Galleria has also has a duty-free store at the Honolulu International Airport. Conveniently located in the heart of Waikiki, is the Royal Hawaiian Center. It is one of the largest shopping centers in Honolulu. The complex has over 110 shops, restaurants and entertainment in three four-story buildings. Here, you can find everything from high end designer stores, art and crafts boutiques as well as convenience stores. 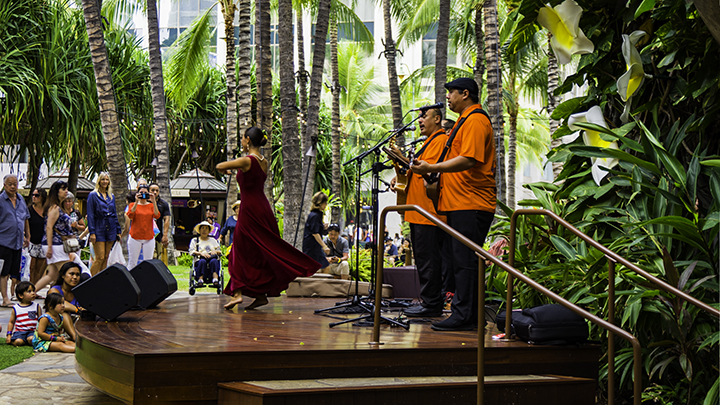 In addition to location, what sets it apart are daily hula, music and craft shows for the entire family. Hula show at the Royal Hawaiian Center.